Tinyard Enterprise Co.,Limited is one of the top level China rotogravure printing machine manufacturers and suppliers, welcome to wholesale rotogravure printing machine from our factory. Rotogravure printing is a very important step for bag making. Most of the bags for packing merchandizes need printing different words, pattern, images. 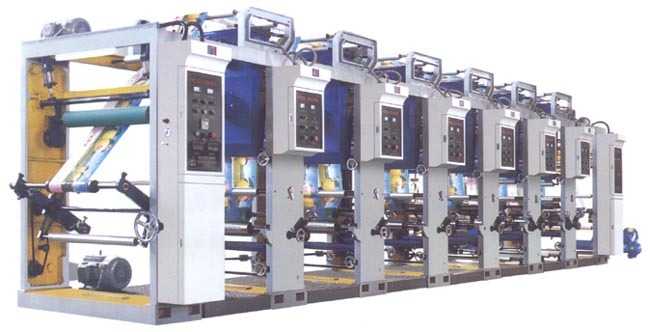 Our film printing machine could in roll print different designs from 1 color to 10 colors. The printing result is clear and very beautiful. It adopts intaglio roller as printing forme. Each roller on each set is used for one color printing. --Continuous printing, automatic feeding and rewinding film roll. --The printing rollers has hardness processing on surface, which guarantee them have much long usage life. --Each set of printer can be easily assembled or disassembled. Customers could select to buy them according to requirement for colors. QDASY-1000 high speed rotogravure printing machine is the second generation of high speed printing machine, which could print reel type film in high speed and high accuracy. 1) Advanced combined transmission system: it adopts separate motors at printing, driving , rewinding portion, which make it has high speed, longer usage life, higher accuracy and stablity. 2) Pneumatic scraper to scrap ink clearly, even pressure. 3) Automatic film connection to gurantee real continuous working. 4) PC control automatic chromatography system to make sure accurate printing.